Jo Pavey MBE is a British long-distance runner, outstanding motivational speaker and five-time Olympian representing Team GB . She has featured in every Olympic game from 2000 to 2016. She has also competed in the World and European Championships as well as the Commonwealth Games . It would be lying to say that Jo has had an easy ride through the Olympic games . From the word go, she suffered from hip and knee injuries shortly after her international debut and reaching the semi-finals of the 1997 World Championships , causing her to take two years out. Moving up from 3000m to 5000m she achieved the Olympic standard and was selected for her first Olympic games in Sydney 2000 . Her performance in Australia made her the fourth fastest British woman of all time over 5000m at the time. Despite sustaining a shin injury and missing the first month of training season in 2001, Pavey won the British 5000m title and was selected for the World Championships in Edmonton. The 2002 Commonwealth Games also saw further problems for Jo. After missing the trials due to a virus and suffering a bacterial infection the night before competing, she still managed to race, holding bronze medal position with 600m remaining. However, she finished fifth and required medical assistance to get off the track due to a later diagnosed magnesium deficiency. Bouncing back the following year, she came first at the trials to determine the British team for the European Cross Country Championships , a major cross country win. Once again, she had to withdraw due to further illness. Sickness continued to affect her career, even in the 2008 Beijing Olympics when she did not start and was therefore ruled out of the 5000m and came 12th place in the 10,000m as well as the 2016 Olympics trials where she was suffering from a chest infection and a virus and still managed to qualify. Not only did Pavey tackle multiple injuries and illnesses, in 2009 she gave birth to her first of two children. Consequently, she missed the marathon and World Championships that year. However, it was only 11 months later in April when she returned to compete and came second in the Great Irish Run . 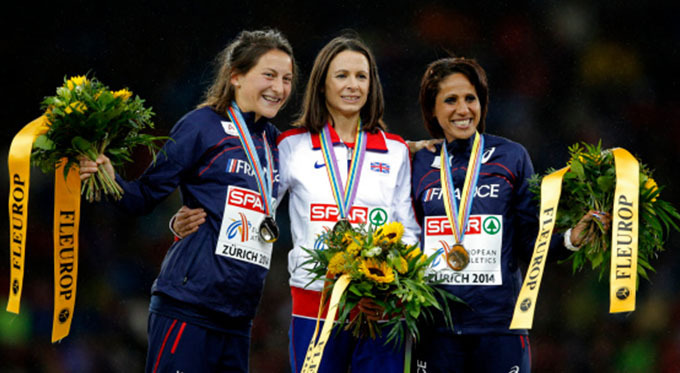 In doing so, Jo Pavey proved an inspiration to not only athletes but mothers as well. Jo’s resilience has meant that she has achieved a total of nine gold medals and one silver between 1988 and 2012. She qualified for her fourth games, the 2012 Olympics at the age of 38, coming 7th in the 5000m and 10,000m with a time that made her the 2nd fastest in history in the age group over 35. She is now striving to participate in her record-equalling sixth Olympics in the Tokyo 2020 games at the unbelievable age of 46, some that most would see as impossible as she is more than twice the age of her teammates. For an incredible opportunity to listen to some of Jo Pavey’s inspirational stories, why not book her as your motivational Olympic speaker today? She’s available to book with the Champions Olympic Speaker Agency for any corporate event, sporting occasion or team building exercises. Simply contact the Champions Olympic Speakers agency by filling in our online contact form or call a booking agent directly on 0207 1010 553.